One class of hollow body electrics is the archtop that I discussed earlier under steel-string guitars with a pick up attached. The famous Gibson ES-150 is such a bird and was Gibson's first entry into the dedicated electric guitar field. It is still in production and still popular in some circles. As I mentioned, if you expect these 'enhanced' acoustic instruments to have a decent acoustic sound, you do need to be concerned about the number and placement of the pickups, but I will refer you back to that section before repeating myself. 1 Feedback is when the sound coming from the amplifier comes back and enhances the vibration of your guitar, and especially your strings. This, in turn, makes your signal get louder, which makes it happen more, and it keeps on going. Controlled feedback can be nice because it makes your guitar get really long sustain. When it gets uncontrolled (most of the time) the frequencies that feedback inhabits most are not the notes you thought you were playing, or wanted; they tend to be high-pitched and irritating, and everyone in the room complains. It can be controlled, but the easiest way is not to use a hollow guitar.  Most electric guitars in this category are actually called 'semi-hollow' body guitars. From the front they look the same, but once you get sideways you notice that they are a lot thinner. The insides are usually more heavily braced than a standard acoustic as well. The reason for this that any time you put a pickup on a regular acoustic guitar, you invite feedback once you plug it in and start to amplify it.1 Thin guitars don't have as much acoustic response, and so this is less likely to happen. That can also be improved in your favor if your guitar top is thick and unresponsive. Nevertheless even the small acoustic response affects your sound and some players distinctly prefer it. However, you do need to be aware that feedback will be more of a problem with even a semi-hollow body than it will with a solid-body electric. Fender Coronado with a floating bridge. 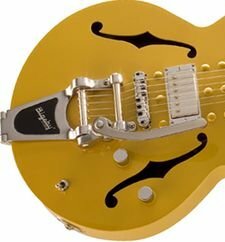 If you are going the semi-hollow route, one thing you need to look for is the bridge. There are two primary types. Older models, following the pattern of the viols on which the archtop guitars were modeled, attached the strings through a tail-piece, like this 1967 Fender Coronado II. The bridge floats free under the strings. This is good for an acoustic archtop. On an electric it is both pointless and irritating. I used to own this same guitar and was constantly knocking the bridge out of place. Each time that happened I had to reset the bridge, which is non-trivial. Gibson ES-399 with a fixed bridge. The tendency in modern thin-line instruments is to use the kinds of bridges you have probably seen on lots of Epiphones and Gibsons. The bridge itself is bolted to the guitar body, and the tailpiece is too. If you are looking for a semi-hollow guitar, I highly recommend picking one up that is built like this, unless there are other overriding factors. See under solid body guitars for a discussion of vibrato (whammy) bars. ESP LTD Solid Body Guitar. What makes one solid-body guitar better than another? If it is an older guitar, the pickups come into play. This is not so much the case any more unless you are buying at the really low end. There are still taste differences, though, as I mentioned earlier. Dual coil, humbucker style pickups will give you slightly stronger mid-range. Single coil ones generally do better with the high end. But there are still differences. Check the other things I mentioned in the pickup section above. 2 Of course, not everyone goes for the lighter gauge, or not as much so. Jazz players, in particular, often prefer the tone and feel of a heaver string, and also have a tendency to look for the cleanest pickups. This also is a function of how much, in your preferred playing style, you end up bending strings. Obviously the lighter ones bend more easily. 3 Modern electrics are virtually all that way. If you are shopping for vintage instruments that you actually want to play (as opposed to simply hanging them on the wall), however, this is something to be aware of. EVH Lighter Model Solid Body Guitar. Much more variation exists in modern guitars on the weight of the instrument. There are two edges on this sword. The most obvious one is feel; you are the best judge of that. If you expect to be 'playing out' and standing holding it on a strap for a couple to four hours, you might want to consider how your back will feel at the end of the evening. Still, there is another side to 'feel.' Some players would say that a heavier instrument gives them a sense of substance that, at least at some level, improves their playing. They don't want to have the impression that they are trying to keep the instrument from floating away. Where you stand on this continuum is completely up to you, but before investing in, say, a Les Paul, which is probably heavier than your two-year-old, consider borrowing one from a friend and do a back stress-test in a close to real-world setting. The PRS (Studio) will be heavier on both shoulders and wallet. There is another issue on which not everyone agrees. A number of players argue that heavier guitars sustain better, which makes a little intuitive sense but ends up not cutting it from a physics perspective. What is true is that resonant bodies (usually the lighter ones) will give you a some more high end, while heavier ones do a little better on midrange. It is also true that harder surface woods (maple, ebony) will improve your high end over, say, mahogany, which is softer and less sound reflective. If this sounds a little like the difference between dual coil vs. single coil pickups, I guess you have been paying attention. So if you really want that high end, pick up single coils on a light guitar with a hard sound-reflective surface. If you strongly prefer mids, go for dual coil on a heavy, but softer wood instrument. Nevertheless, if you are looking at a piezo-electric setup, body resonance is definitely something you want. Bold-on Neck from a Fender Stratocaster. Attached neck on a Gibson SG. Smooth transition with Carvin neck-through-body. One thing which may have more effect on your playing is how the neck is attached. There are two major categories, and one sub-category. Most Fender guitars and their ubiquitous imitators use bolt-on necks. If you play up the neck a lot you will find yourself running into the point where the neck attaches to the body. Most guitarists don't have a problem with this, and it does have the advantage that if you need to replace the neck for some reason, it is extremely simple process. In contrast, Gibson and its imitators tend to attach their necks, although, as you can see from the picture, as the neck hits the body there is a clear change in thickness, so the difference in feel between this and the bolt-on is not dramatic. The third option, which is really a variation on the second approach is to smooth this transition. This is usually associated with what are called "neck through body" guitars. Some do not seem appreciably different in feel, although this approach does provide a stronger neck-to-body connection. 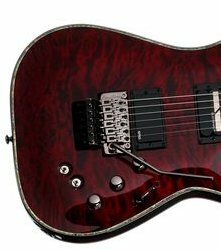 Some however, like the Carvin in this image, do provide a smooth transition between neck and body. 4 This will not be an option for you, in all probability, if you are using a semi-hollow instrument. The reason is that Floyd Rose vibratos run clean through the body of the instrument in a way that would be tricky with a semi-hollow. I did not say impossible, though, just tricky. Normandy Archtop with Bigsby Vibrato. Schecter Hellraiser with Floyd Rose Vibrato. Something you might, or might not, want on your guitar is a vibrato bar. These are sometimes called "whammy" bars, which may be a more descriptive name. Actually, you've been hearing vibrato for years on instruments with no special devices attached. You get normal vibrato by moving the fingers of your left hand on the strings (side to side, back and forth, in circles-each has its own special sound), or rocking your right palm on the bridge. If that is all you want, you won't like the bar. I made good and sure there was one on my first decent electric Later on, I unscrewed it and just stuck it in my case, since I used it so little. But sometimes, when you want that whammy sound, nothing else will quite get you there. Smooth whammy was popular with a lot of beach music in the 60s, but one of my favorite subtle uses is in Bruce Cockburn's "Cry of a tiny babe." Any vibrato bar will give you that sound. The king of vibrato in the sixties was the Bixby pictured on the left above. For the other end of the spectrum, though, listen to Eddie Van Halen's "Eruption." For that you are going to need a high-end modern vibrato, probably a Floyd Rose or something licensed by them (on the right above).4 One of the problems with vibratos much of the time is that they get you out of tune. This shouldn't be surprising since you are intentionally at least partially detuning the guitar when you use them. The Floyd Rose approach ties your strings down before you mess with the tension, so that more often than not it comes back when you release. It also gives you a lot more note shifting distance. You can go all the way down to completely loose, or up until your strings break (they are not paying me, honest). This is how Van Halen is getting that sound, but if you just want some occasional wobbly guitar, it probably is not worth the extra expense, although they do stay in tune nicely. There is a whole lot more on vibrato bars in the Wikipedia article on the subject, including some more recordings. Hybrid guitars are designed to allow the performer to have some of both worlds (acoustic and electric sounds). They generally do this with a body designed have some resonance and use a piezo pickup, often in conjunction with a standard magnetic one. The piezo gives an acoustic sound while the magnetic pickup provides the electric. Some sort of switching allows the performer to use either one or both, just as in other dual pickup systems. No surprise, a semi-hollow guitar can be setup this way, particularly if it is constructed with resonant woods. The Taylor in the picture above is obviously based on the semi-hollow, although it is not arched. In this case the f-holes allow the top to breathe which helps its acoustic qualities, but they are not essential (as with the Ovation in the next image). But the term 'hybrid' is something of a catch-phrase that picks up a lot more varieties of guitar. Any time you have an acoustic (of any variety) that has a built in piezo, or any other kind of pickup, you will see it called a 'hybrid' by its manufacturers. At the other end of the spectrum PRS (Paul Reed Smith) makes several straight up solid-bodies that happen to have peizos, as well as their usual magnetic pickups. They call these 'hybrid,' too. The first group will allow you to amplify, but you will not get that full electric sound. The second group will not have a problem with that, but their piezo sound will not have much acoustic quality (which is not to say that they would not be useful, if that is the sound you want).